Calgary, AB – The National Lacrosse League announced today that Calgary Roughnecks forward Curtis Dickson and transition player Zach Currier have both been named to the 2018 NLL All-Pro Second Team. Currier has also been named to the 2018 NLL All-Rookie Team. 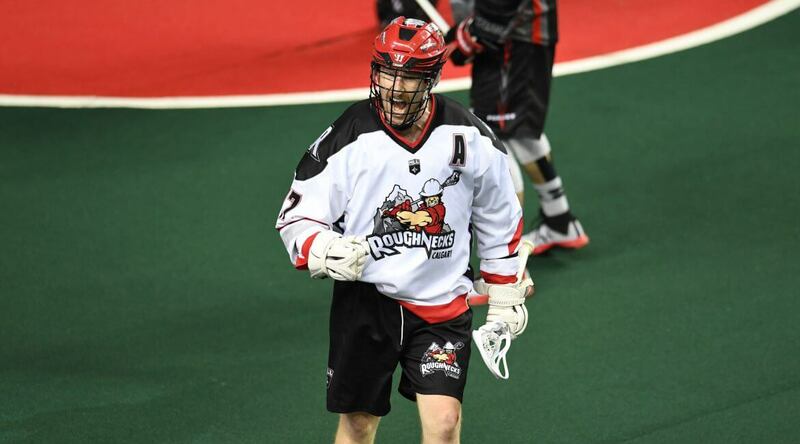 Dickson, a native of Port Coquitlam, British Colombia, wrapped up the 2018 season tied for second in the NLL in goals scored with 47 and made 45 assists for 92 points. He was tied for first in the NLL with five shorthanded goals and posted a career best of three shorthanded assists. His ten playoff goals in just two games in 2018 tied Josh Currier of the Rochester Knighthawks for league best. Dickson, now named to an All-Pro Team for the third-straight season, fifth time overall, was selected by the Roughnecks third overall in the 2010 NLL Entry Draft. Over eight seasons in Calgary, the NLL veteran has amassed 360 goals and 641 points in 138 games. Dickson joins forwards Joe Resetarits and Lyle Thompson, defense Kyle Rubish, goalie Dillon Ward and fellow Roughneck Zach Currier on the All-Pro Second Team. Currier, who just completed his rookie NLL season, picked up a league leading 200 loose balls becoming just the second rookie to lead the league in loose balls after Jim Veltman in 1992. The 24-year-old transition player surpassed Latrell Harris’ 2017 NLL record for rookie caused turnovers with 33. He finished the 2018 season fifth for rookie scoring with 22 points including nine goals, one power play assist and a shorthanded assist. Calgary selected the Peterborough, Ontario product third overall in the 2017 NLL Entry Draft. Joining Currier on the All-Rookie Team are forwards Josh Byrne, Eric Fannell, and Austin Shanks, transition player Colton Watkinson and defense Jake Withers. The 2018 NLL Season Awards are determined by a vote of the league’s Board of Governors, General Managers and Head Coaches.